NEW YORK (WABC) -- An NYPD officer performed the Heimlich maneuver to save a man choking on candy in Brooklyn Saturday night, police say. At about 10:15 p.m., the NYPD said a 49-year-old man walked into the Transit District #30 stationhouse at Hoyt and Schermerhorn Street in obvious medical distress. He was clutching his throat and gasping. 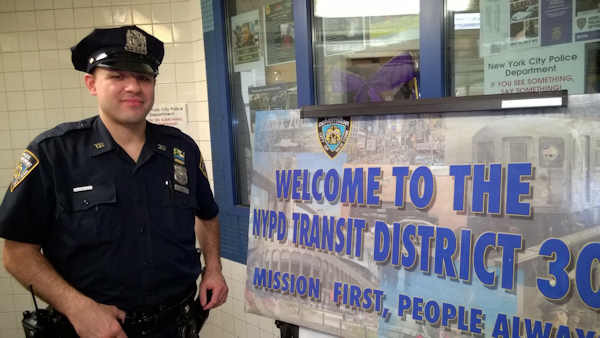 Officer Soner Ozuk, assigned to Transit District #30 asked him if he was choking, to which the man nodded yes and then collapsed to the ground. Officer Ozuk performed the Heimlich maneuver and dislodged what the man later said was a "lifesaver" candy. The man was taken to Brooklyn Hospital via EMS, conscious and alert, and was treated and subsequently released. Sergeant MD Rahman coordinated a swift EMS response while Ozuk tended to the man.